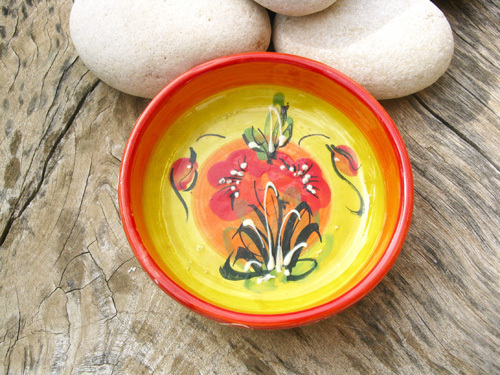 These small Spanish dishes are decorated with a splash of bright red poppies on a rich yellow and orange background, and a detailed outer rim. Each bowl is individually handpainted in Andalucia, southern Spain, so when you order one it will be SIMILAR to the designs shown here although maybe not identical. They are made from the local clay of the Alpujarras and have a lovely rustic quality. What a stunning little gift to give a friend or loved-one for eats, salad or tapas in true Spanish style. A gift with soul. Detail: The bowl measures 13cms (5") in diameter and 4cms high. Because it is handmade, patterns may vary slightly and no two bowls are absolutely identical. The Poppy Field Spanish bowl would make a great present to pass on your best wishes and make someone feel very special . 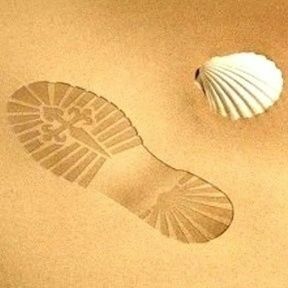 . . a gift from Spain to inspire that Mediterranean feeling, and a lovely housewarming present. Comes gift-wrapped, like all our presents - and we can print a personal message on your behalf.